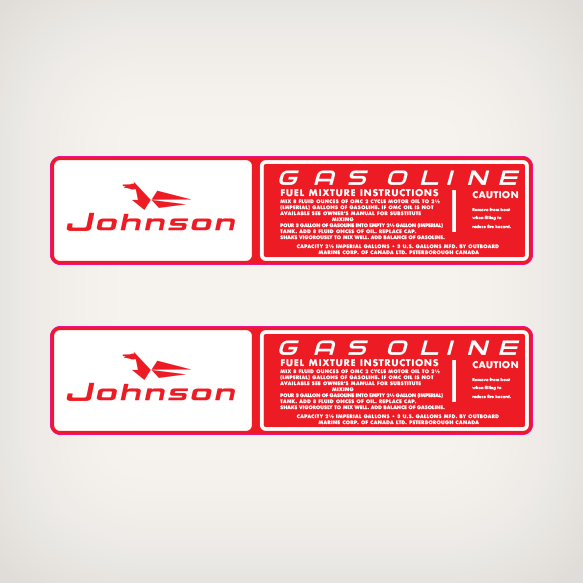 3 U.S Gallons Fuel Tank decal replica Sold by Set for 1960's Johnson Fuel Tanks. POUR 3 GALLON OF GASOLINE INTO EMPTY 2½ GALLON (IMPERIAL) TANK. ADD 8 FLUID ONCES OF OIL. REPLACE CAP. SHAKE VIGOROUSLY TO MIX WELL. ADD BALANCE OF GASOLINE.